I want you to try something. Take a second and write down all the ways that the person you’re currently dating annoys you, or the ways that you wish your relationship was different. Got the list? Good. 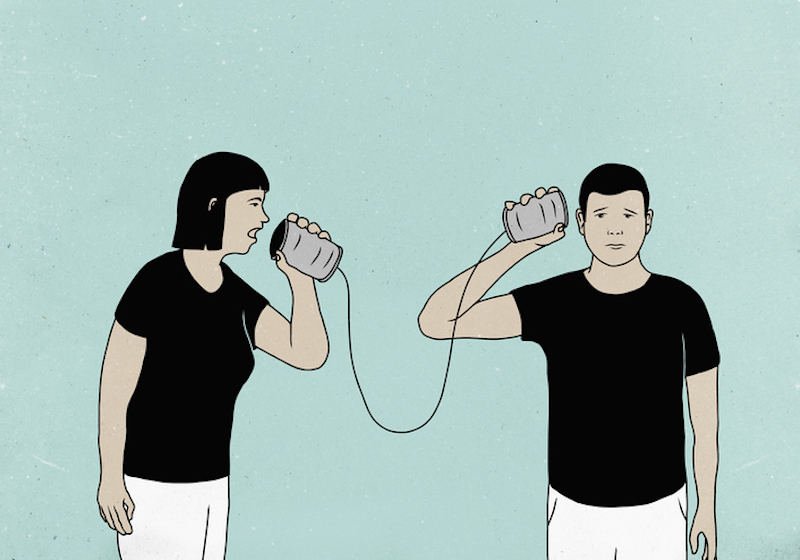 Now, count how many of those issues you’ve actually communicated to your partner. If you’ve communicated over half of them, I’m impressed. If you haven’t communicated any of them to the person you’re dating, I’m not surprised. I’m not even disappointed. It can be really hard to talk to the person you’re seeing about habits or practices that bother you—and it’s even harder when you’ve only recently started dating that person. I may be super outspoken on Twitter and have no problem calling guys out at the bar, but when it comes to someone I really like, I suddenly clam up. I worry about “nagging” or being seen as “high-maintenance”—especially early on in the relationship. Obviously, that mindset is problematic. I know I’m not alone in it either, but let’s save that topic for another day. Instead, I want to talk to you about how the guy I’m seeing suggested a new way for me to express my concerns more comfortably. That way, we could actively work on fixing our problems. The guy—let’s call him Jacques—recognized that I don’t always say what’s on my mind. I have the tendency to just “go with the flow”—even if I don’t really want to. Just a few months after we started seeing each other, we were on our way to Chipotle when he casually suggested that we have a “grievance session.” It sounded terrifying, but it also sounded like exactly what I needed. (Plus the writer in me knew it could make a great story.) So I said yes. About a month later, when I had a good list of things I wanted to bring up, I told him I was ready. So we sat on his balcony and took turns expressing our concerns, and now that I’ve done it, I think you should, too—especially if you’re not great at communication either. Preparation for my grievance session was a cross between journaling and preparing for a speech. Every time Jacques did something that pissed me off or made me feel insecure, I wrote it down. Not only was this way better than sending a passive-aggressive or pissy text message, but it also gave me time to think about why certain behaviors upset me, like not using exclamation points in text messages to show his excitement for our dates. Okay, maybe that exclamation point issue wasn’t the best example. Here’s a better one: Jacques and I both work from home and live in different cities. I visit him around once a month. The nature of his work requires that he stays “online” once he starts, whereas I can shoot out a few emails and be done at a moment’s notice. When I visited him, I didn’t love being in his apartment and not knowing when he planned on working. I always felt like I was waiting in limbo, wondering whether we’d get some quality time sooner rather than later. One night, I went out with a friend nearby and got a text from Jacques asking when I’d be back at his place. I said “soon” and called an Uber, eager to get home and back into bed with him. When I arrived 40 minutes later, I found him at his desk absorbed in his work. I know personally how annoying it can be when someone assumes you’re free whenever just because you set your own hours, but I didn’t like feeling subject to his work whims. Adding this to my list of grievances gave me a chance to think of possible solutions that would fix the problem, and it was one of the most effective conversations we had in our session. I asked (nicely) if it would be possible for him to develop some sort of loose work schedule so I’d know when we could have dedicated time for each other during my visits. That way, I’d also know when I should get absorbed in my own work or even make other plans with friends who live nearby. I don’t know that I would have ever brought this issue up if we didn’t have an “official” grievance session. Honestly, I think I would have just slowly drifted away from the relationship if I kept feeling like things weren’t going my way (my M.O.—I’m trying to work on it). Of course, there are definitely things you shouldn’t bring up in a grievance session. You have to use your best judgement and put yourself in the other person’s shoes. For me, that meant only bringing up issues that had feasible solutions, rather than just griping for the hell of it. You’re probably thinking, “That sounds like a lot of work for someone I’m not even officially in a relationship with.” And truth be told, that’s exactly what I would have said about a year ago. I told myself that I was way too young to be “working” on a relationship, that I’d rather do that when I’m married or have kids. I still think this way sometimes, but I also think about how, in all my former relationships, I brushed off annoyances, assuming I would get over them or they’d miraculously go away. The thing is, most of them never went away or I never got over them, so I’d find myself stuck in a relationship where I was comfortable and emotionally attached—but unfulfilled and unhappy. Jacques could’ve not reacted so well to my grievances, but that’s still helpful for me. He could’ve said, “Okay, Ashley, I understand how you feel, but I’m not changing that. I work for myself so that I don’t have to set a schedule.” While that wouldn’t have been the ideal reaction, it would have shown me that he was never going to change—or that he wasn’t invested in our relationship enough to change for me. I would realize that dating him couldn’t make me happy, and I’d start distancing myself from our relationship. He also could have nodded and agreed to change, altered his behavior for a few days, and then gone right back to his previous work habits. Truth be told, Jacques has nearly slipped back into his old ways a few times—but now I have the guts to remind him how it makes me feel. Our grievance session made it clear that he wants me to be more vocal, so that’s what I’m doing. I’ve even thought about suggesting another one, but then I realized that, because of our first session, I’m a lot more comfortable bringing things up in real time. And that’s even better. Oh, and you’re probably wondering what Jacques had to say about me during our grievance session. After all, he was the one who suggested it. Initially, I worried that he had tons of concerns since the whole thing was his idea. But once we did it, I realized that I was the one with a long, pre-written list. He only had two “grievances” to address. The first was that I sometimes have bad breath and the second was that he was annoyed I expected him to always pick me up from the airport or train station. It’s really amazing what some mouth wash, an Uber, and more communication can do for your relationship. I hope you try it sometime.